Delving deeper into English history, it is clear that there is a necessity to contextualize the significance of the American revolution within the institutional innovations of past peoples. In this way, we can appreciate the tumultuous heritage that gave birth to many of the Founders’ ideas and more fully comprehend the historical difficulties the Constitution was intended to allay. 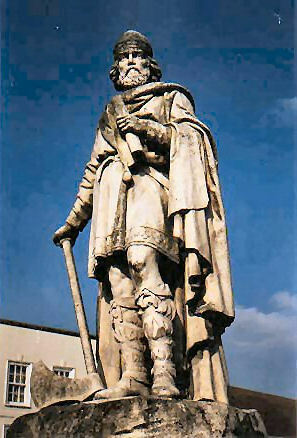 One institutional innovator was the ninth century English king Alfred the Great. Being an anomaly that one of my two middle names is Alfred, I long considered it a bit of baggage that one of my namesakes had such a disconsonant appendage. It turns out that Alfred is a great figure in English lore, and bearing such a horrible sounding name was not distinctly uncommon in his place and era. One day, or perhaps one night, in the late seventh century an unknown party traveled along an old Roman road that cut across an uninhabited heath fringed by forest in the Anglo-Saxon kingdom of Mercia. Possibly they were soldiers, or then again maybe thieves—the remote area would remain notorious for highwaymen for centuries—but at any rate they were not casual travelers. Stepping off the road near the rise of a small ridge, they dug a pit and buried a stash of treasure in the ground. For 1,300 years the treasure lay undisturbed, and eventually the landscape evolved from forest clearing to grazing pasture to working field. Then treasure hunters equipped with metal detectors—ubiquitous in Britain—began to call on farmer Fred Johnson, asking permission to walk the field. “I told one I’d lost a wrench and asked him to find that,” Johnson says. Instead, on July 5, 2009, Terry Herbert came to the farmhouse door and announced to Johnson that he had found Anglo-Saxon treasure.